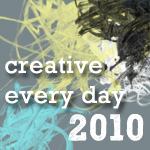 Ways to share: Once you've signed up, you can leave a comment on this post and/or use the "Mr. Linky" widget below to link to a blog post(s) about your creative activities during the days of 3/15/10 - 3/21/10. Theme: The (totally optional) theme for March is Stories. I'll be posting about the theme throughout the month and you can feel free to use it to inspire your creations, follow your own muse, or do some combination. You can find out more about this month's theme and some prompts to get you started with it here. each piece tells a story . I thought I’d check in. I’m playing with story and narrative with my MsKitty drawings and paintings; she’s on a Quest. Today she visits the kitchen sink. I’ve been playing around with using wax as a ‘resist’ in watercolour paintings and have shared some ideas on my blog about it. I’m afraid I’m woefully behind at posting my creative journeying on the blog – I never seem to find time to edit photos to my satisfaction… but I am doing something creative every day (and loving it . This week for me is about acknowledging stories that will be lost because my first on-line community Gaia http://www.gaia.com has ran into financial difficulties with the recession and will close at the end of March. I have been a member since December 2006. I have most of my important blog posts back up… but not everyone does… and the massive amounts of material in group discussions, I’m afraid will mostly be lost. A new Gaia ning has been set up to provide a place maintain and connect. This story is making it difficult for me to concentrate on other creative work. I will get up and write each morning none the less. Thank you Leah for the opportunity to check in. Its been a week! I was sick for most of the week last week, and now just coming around to feeling better; I have chronic sinus issues and being pregnant makes recovery even longer than usual. A bit behind with my postings with this month but staying creative all the same. Ahhh….spring is almost here in Vermont! my story telling and creative thoughts for this month prompted a blog just for that use. go to: http://pearlmuse.blogspot.com to view and stay tuned! Gearing up for another Art Walk. A wonderful Gallery wants me to fill a space with art, merchandise and other eclectia! Could be the beginning of a success story! I’ve been experimenting with art journaling. I’m not very good at it but I don’t believe that is the point & so have been very brave & posted photos of my 1st attempts on my blog. This is all part of my attempts to quiet my inner critic & experiment in mediums I am not experienced in. Not sure there’s much of a link to the story theme this week except that I feel I am embarking on another strand to my own life story. Hi everyone! This is my first week of the Creative Every Day challenge! I discovered this blog and challenge last week. I’ve been striving to spend time creatively every day before this challenge, so I love the opportunity to find a community that is doing the same thing. This past week I’ve been focusing personally on my journaling – both art and written – and on visiting old and new places through the photos on my blog. I have been enjoying all the prompts and looking at people’s work! I love stories, and have found that I just can’t post my daily picture without saying a few words as well. I set myself a challenge to make a picture every day at the start of this year and have reached the point it is a bit of a strain some days, so it is fantastic to have contact with other visual people and see what inspires them too. Here’s my effort so far, if anyone is interested come and pay me a visit. http://joslittlepictures.blogspot.com/ Coming from the Southern Hemisphere means my seasons are the opposite to lots of you which feels a bit out of step, but I will cheer myself in the depths of our winter with your sunny pictures! I’ve been so out of it. Here I am trying to get my creativity back. Spider webs and embroidery. Go figure. I’m going with the inspiration. I guess that’s a story of sort. Aren’t spiders related to story telling mythologically? Making my first check in after coming off a weekend whirlwind of creativity and fun. I’m not much of a story teller – I tend to get lost along the way and forget the point or reason I was telling the story in the first place. My “journey” is more of a “meander”, which may not be a bad thing. This week I’m really struggling with my principles as a designer. I’m really a pushover, and I have trouble saying no. Now I’m stuck with an assignment that I don’t like and that I can’t see the value in. How should I deal with it in a professional manner that won’t damage my credibility? On another note, I finished like a project and a half yesterday and I am feeling really energized and good in my crafting! I should post them on my blog tomorrow afternoon and I hope you all will check it out! This is my first week with this, as I just discovered your site yesterday. Thank you for the little push to start documenting my creativity. I’ve been thinking of doing something like this for awhile now. I look forward to checking out what everyone else is working on as well! Feel free to stop by my blog and leave a comment. I do enjoy meeting new people.